Soft white hooded baby towel or cuddle robe featuring a bright cerise pink bias trim around the edges for that luxurious finish. Soft white hooded baby towel or cuddle robe featuring a bright cerise pink bias trim around the edges for that luxurious finish. 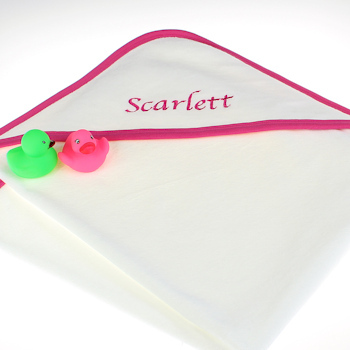 You can choose to have this beautiful gift made extra special with babies name personalised on with embroidery. Quality soft cuddle robe made from 100% absorbant cotton measuring approximately 75cm by 75cm to keep baby snuggly warm after bath time. This cuddle towel will make an extra special and unique gift for babies. Just fill in a name or wording for us to embroider and choose a letter font style. We will embroider in a thread colour to match the trim.